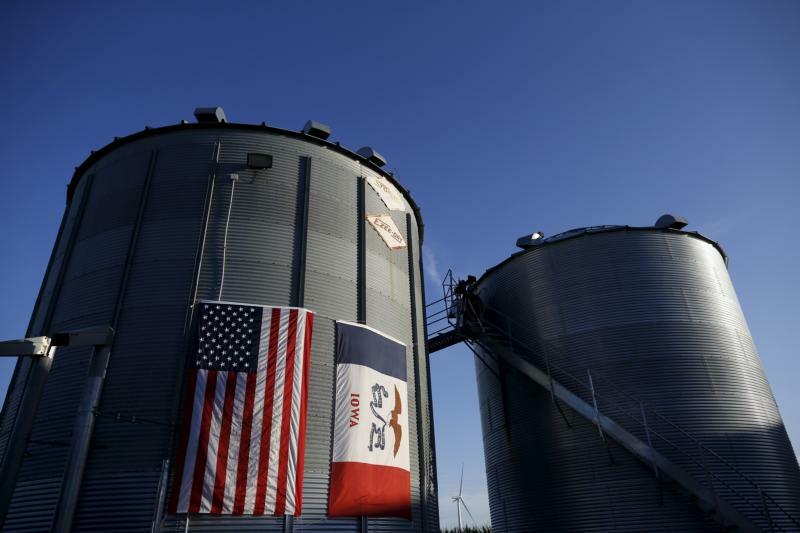 In this 2015 file photo, grain silos are seen in Haverhill, Iowa. (CNS photo/Jim Young, Reuters) See FARM-BILL June 28, 2018. WASHINGTON (CNS) — With House passage of a new five-year farm bill in the rearview mirror and passage of a Senate version looming straight ahead, it’s going to take a House-Senate conference committee to reconcile what is turning out to be considerably different versions of the farm bill. “We’re in an interesting period,” said James Ennis, executive director of Catholic Rural Life. It’s the House version that has Ennis and other rural advocates concerned. It passed June 21 by just two votes, 213-211, and it took several minutes to break the deadlock while supporters rounded up two more members to vote for it. All those voting yes were Republicans; 20 Republicans voted no, as did every Democrat voting. The Agriculture Nutrition Act, as the House bill is known, removes money from conservation programs found in previous farm bills, which are reauthorized generally twice each decade. The Conservation Stewardship Program was cut entirely. Access to capital for business training services also was slashed, Ennis said. Anna Johnson, an Iowa-based senior policy analyst for the Center for Rural Affairs, is concerned with trends in rural life that see farms getting bigger, with fewer people to work on them. That leads to smaller town and the problems that come with it. But she spied something in the House version of the farm bill that would add a new threat to rural life. In so doing, she added, “it helps drive farm consolidation, which drives up land prices and rent prices.” Agribusiness concerns, Johnson said, will more easily be able exploit the loophole and grab a larger chunk of federal farm subsidy money. The House version of the farm bill imposes stricter work requirements for the federal Supplemental Nutrition Assistance Program, once known as food stamps. Some have predicted 2 million people would lose SNAP benefits were the House bill to become law, but the number of those affected in rural communities is not known. “My feeling is they’ve got a job, they should do it,” Davis said of Congress.